Yukon Gold online casino has been around since 2004. Since it went live, the casino has become a big name in the online gaming world. Yukon Gold casino belongs to the Casino Rewards Group and Interactive Gaming Council. For players, that means fair game play and some incredible loyalty rewards. Some of the games are available in flash versions, but to access the casino’s full menu of games, you need to download and install the software. The Casino Rewards Group is the leader in the industry. A partner of Microgaming casinos and a member of the Interactive Gaming Council, this brand operates a huge array of online casino games. What’s more, the group follows a strict code of conduct to ensure honest and fair gaming. They accept a variety of currencies, including GBP, CAD, USD and EUR. Players from around the globe are welcome, except players from the U.S. To date, the group has 11 online casinos and has remained the biggest name in the business for more than a decade. All of the Casino Rewards Group’s sites are powered by Mircrogaming, which means a cutting-edge platform and an impressive arsenal of games for players. Further, the brand’s reputation ensures that players enjoy professional customer service, hassle-free payments, seamless account management and fast payouts. The overall Yukon Gold theme is the Wild West. The website is simple, comprehensive and easy to navigate, and while the theme is splashed across every page, there aren’t any heavy or annoying graphics, making the site quick to load and quick to navigate. Best of all, the Yukon Gold casino website is set up in a way that is easy for all players to understand and use. Most online casinos would tell you they have hundreds of games, but never really devise an extensive list, you’ll usually finds bits and pieces of information scattered about or within the FAQ pages. Where Yukon Gold differs is that is provides easily accessible, transparent information right at your fingertips. The casino relies on Microgaming to take player’s gaming to an immersive and interactive level, and its received acclaim for its use of the Viper platform, which serves up high-def graphics and crystal-clear audio. The casinos’ payout rates stand at 97%. So, what exactly can you expect at Yukon Gold casino for your online gaming needs? The bad news is that Yukon Gold doesn’t have many promotions on the go. The good news is that the welcome bonus gives you 125 chances to win massive jackpots (in other words, 125 free spins). When you open a new player account and make your first deposit, you get 125 chances on the myriad of slot games for just £10. One your second deposit, you get a 100% match deposit bonus up to £150. Sign up takes a matter of seconds and you can claim your 125 chances right from the get-go. What’s more, when you sign up, you automatically become a Casino Rewards loyalty member. The loyalty programme allows you to earn points from member casinos and take part in monthly and weekly promotions as they become available. The Casino Rewards Group offers big online jackpots and regular payouts. In fact, players enjoy over £10,000 worth of bonuses in just their first year. The group also offers free-to-play features for players who have just signed up. So, if you register at Yukon Gold, you qualify for start-up bonus money and you can withdraw a portion of your start up bonus provided you make the qualifying deposit into your player account. Free play along with match bonuses are also regularly offered and are similar to other online casino sites. With the Casino Rewards Group, though, you have just one chance to redeem a bonus at any of the group’s sites. Yugon Gold Casino accepts all major credit and debit cards. The site also accepts e-wallet payments, prepaid vouchers and direct wire transfers. Withdrawals are processed within 48 hours and there’s a minimum withdrawal of £50. As for maximum withdrawals, if you win the sum of 5 times or more than your total purchases across the Casino Rewards partner casinos, you can only withdraw your winnings at an amount of £4,000 per week. The Microgaming Viper platform is highly regarded amongst veteran online gamblers. Microgaming’s HQ is in the Isle of Man, and the developer specialises in slick graphics, incredible sound effects and exotic titles. In fact, you probably recognise many of Microgaming titles, including Lord of the Rings, Batman and Game of Thrones. Thanks to Microgaming churning out incredible slots month after month, Yukon Gold Casino is over-flowing with sensational games. There are actually more than 600 titles to keep you busy, including traditional 3-reel slots, arcade-style games, and 12 progressive jackpots. While most online casinos have an array of titles to choose from, you’ll have a hard time finding many with progressives in the double figures. They’ve even been filed under their own convenient menu. Some of the most popular titles to look out for include Forbidden Throne, Girls with Guns, Terminator 2, Jurassic World and Castle Builder 2. As for video poker, you can go completely retro with Jacks or Better, Deuces Wild, Aces & Faces or Deuces & Joker. Progressive you’ve just got to try your luck on include the likes of Mega Moolah, Triple Sevens Progressive Blackjack and Caribbean Draw Poker. When it comes to table games, prepare to be amazed. There is an exceptional assortment of traditional games available, from modern blackjack variations to video poker, roulette and a few casual games. There’s even keno, craps, baccarat and Pai Gow Poker. Roulette variants include American, European and French, while blackjack players can drift between variations like European, Spanish, Vegas and even Atlantic City. If there’s one area that we can fault Yukon Gold Casino, it’s that it doesn’t have live dealer games, which we’d like to see added in the future. Since Yukon Gold Casino hosts the Microgaming platform of incredible games, you just know you’re going to get to play on the go. In fact, there are 150 games optimised for your smartphone or tablet. While most players are happy enough accessing the casino from a desktop device – be it Windows or Mac, you can also access the casino’s site directly through your Android, iPad or iPhone’s browser, login and start playing. It should be noted that while both Windows and Mac are compatible with Yukon Gold casino, Mac is not compatible with the downloadable casino. So, if you do want to download the software to your desktop, you’ll need Windows. Yukon Gold online casino is licensed and regulated by the Malta Gaming Authority and UK Gambling Commission. Both are highly regarded as reputable regulators. In terms of safety, Yukon Gold understands how important that is to its players. They have a system in place to ensure you can deposit and withdraw your funds with complete peace of mind. Saying that, they’ve implemented a 128-bit encryption to keep your accounts safe. As soon as you setup your password, only you know it and only you are able to access your account. Encryption technology keeps user data private, preventing the leakage of your gaming history and personal account details. What’s more, this casino comes equipped with the eCOGRA seal. In other words, Yukon Gold is committed to fair play, guaranteeing you a fair chance of emerging victorious from your gaming sessions. The casino further has active policies in place that concentrate on eliminating underage and problematic gambling. Just sifting through other reviews online, it’s apparent that Yukon Gold online casino offers an attractive and responsive customer support department that strives to cater to your needs whenever necessary. You can reach out to customer support via live chat, phone or email. Most players seem to favour the live chat option, which just takes the touch of a button. Support is available in several languages so there’s no problem if English isn’t your first language. The team has a reputation for being friendly and knowledgeable, so your questions and concerns are sure to be dealt with kindly and efficiently. Signing up with Yukon Gold online casino takes seconds and once you have made your first deposit, it takes just 20 minutes for your 125 free spins and match bonus to kick in. If the bonus doesn’t show up, or you encounter any concerns along the way, just contact one of the stellar customer support staff and they’ll help you out right away. There are experienced operators available every day, every hour, all year long. The payment processing times are fast and there are plenty of banking options, along with top-notch safety and security and fair gaming. The only downfall at Yukon Gold is the lack of live dealer games. This is a popular option at so many online casinos these days, with more and more players enjoying live interaction and the feel of a land-based casino, but we hope Yukon Gold will consider adding at least a few live games in the future. All in all, Yukon Gold’s number one priority is giving you a good experience. The casino wants to see you be the next person on the winner’s list. 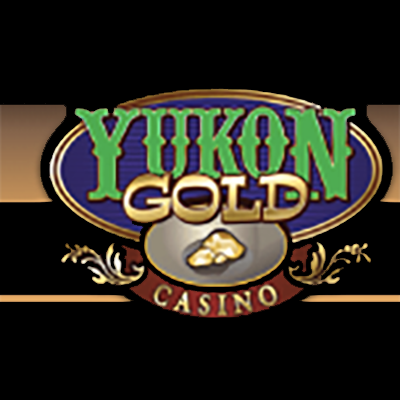 With hundreds of incredible slots on offer, along with card and table games, it’s easy to see why Yukon Gold stands out as a top online casino operator. Claim your bonus today and see for yourself!